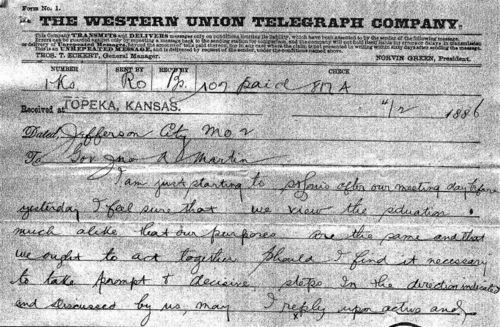 Missouri Governor John Marmaduke telegrams Kansas Governor John Martin regarding the Missouri Pacific Railway strike of 1886. Marmaduke states he has issued a proclamation resuming traffic of the Missouri Pacific trains and warning persons involved not to interfere with operations of the train or railroad property. Call Number: Governor's Office Correspondence Files, Governor John Martin 1885-1889 Correspondence received box 29, Folder 6, Strikes Missouri Pacific Railroad March April 1886.